Let’s face it…..parenting is tough! With this class you will develop skills to reach the heart of your child. Lessons will help strengthen the relationship with your spouse, teach your children first time obedience, and setting goals and boundaries. You will interact with other parents and develop life time relationships as you explore God’s way of “growing your kids.” If you have children ages three and up, this class is a must!! A husband and wife commitment to take the class is required if you are married. 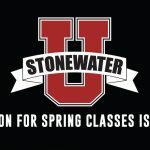 This class is a 14 week class on Tuesdays from 6-8pm. Class begins on February 7th and costs $40.00 per individual or $75.00 per couple.